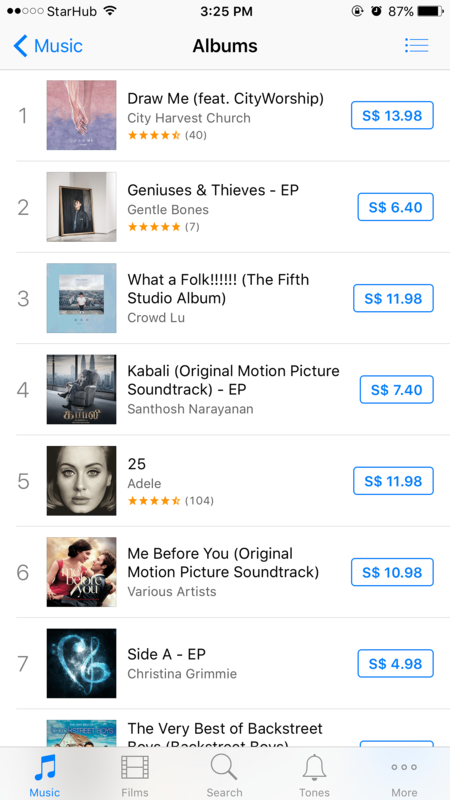 SINGAPORE - City Harvest Church's new album Draw Me has shot ahead of the likes of Gentle Bones and Adele to sit on top of Singapore's iTunes charts. The 13-track album, which was released on the store on Friday (June 10) and features CityWorship, has sold enough copies at $13.98 a pop to top the albums chart as of 3pm on Tuesday (June 14). It has also attracted 40 ratings and reviews, most of which have rated it five stars. "Very fresh and contemporary style too! Everybody should listen to this album," writes one reviewer under the handle RayThan. "Very refreshing to the spirit," says another under the pseudonym Meowlet. Its apparent popularity is not limited to digital stores. Physical copies of the album have sold out, the church said on its Facebook page. "The first print run of the #DrawMe album by CityWorship is officially sold out at The Ink Room!" it said in a post on Monday evening. None of the album's songs, however, appear on Spotify's Singapore charts. Church co-founder Ho Yeow Sun, whose stage name is Sun Ho, appears on four of the tracks. "Recording 4 tracks for this album has been an amazing journey for me. When I step into the studio, I set aside the cares and burdens that I face daily, and I find myself just worshipping," she said in a Facebook post on June 2. Ms Ho's husband and church co-founder Kong Hee, along with five other church leaders, were convicted last year of misusing $50 million in church funds as part of a plot to further Ms Ho's music career. They have filed an appeal. Ms Ho's songs, including one featuring hip-hop musician Wyclef Jean titled China Wine, found infamy online, partly due to a controversial music video that featured Ms Ho gyrating in skimpy clothing. A post on the church's newsletter website said that the new album is "one of the most emotive albums the church has put out". "Draw Me is significant because it represents the sound of our church clinging on to God through our most difficult seasons," said the album's creative director Mark Kwan. He added: "...it means a lot for any member of City Harvest who has been through the last six years of trials and struggles."